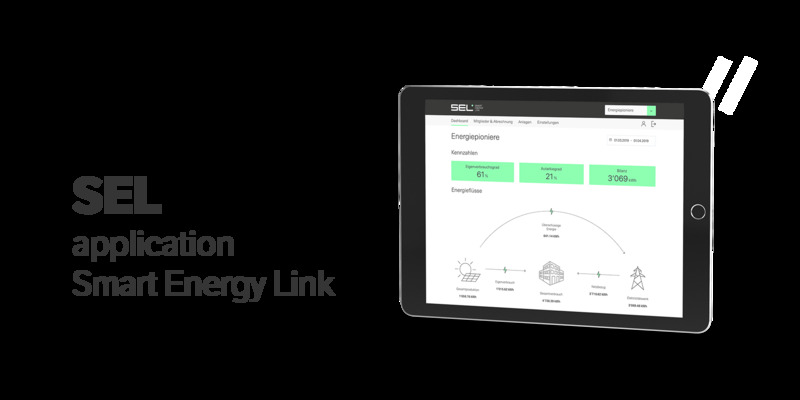 The centrepiece of Smart Energy Link’s solution is a simple, user-friendly customer portal, which we have developed using the latest technologies, such as Python and Vue.js. The customer portal is linked with various electricity and water meters located in the buildings of the “self-consumption community”. The vast amount of data collected is automatically evaluated on the customer portal in real-time. The user then gets easy access to this data in the form of interactive diagrams. Up until now, billing for electricity was the job of energy companies. In “self-consumption communities”, this complex task now lies with property managers for the first time. Our aim was to actively simplify this task. That is why we developed an easy, automated utility bill on the SEL customer portal. It is based on the vast volume of data continuously supplied to us by the meters. The complex calculations surrounding electricity tariff models are processed in the background. With just a few clicks, you have a simple, transparent and user-friendly utility bill for the amount of sustainable electricity used. Our biggest challenge was making the complex topic of electricity in “self-consumption communities” easy for users. We were working in a field that was completely new for all those involved, so continuous learning and trying new approaches was a popular way of working. The key to success for this project was taking a customer-oriented approach to creating the service design and user experience in order to find a holistic and simple solution. Furthermore, using the agile scrum method when executing the project helped us to implement our solution quickly and efficiently and allowed us to continually integrate our newest findings into the solution. The simple and user-friendly customer portal is the centrepiece of our solution. It allows the costs of electricity, heating and water to be separated and billed in a very simple way that saves time and does not require expert knowledge.